But, you don't have the 3B and 4B leads. What's up with that? Well in 0.5mm Super Hi-Polymer the range is 4B to 6H, and 2B to 4H in 0.7mm. I'm not sure about AIN but I suppose it's the same. Anyway, 2B to 2H is all thats available in this part of the world. Pentel don't exist here in their own right, and the Pentel agent only imports a very small selection of their pencils and leads. Everyone is forgetting the Pilot Neo-X lead which is quite difficult to find (at least in the states). However, this lead creates a more intense and darker line than the Pentel lead. I like 4B lead because it writes really smoothly. The bad part is that it gets really smudgy. 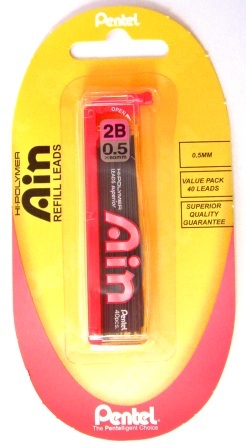 I've been looking around for the AIN leads (I live in Los Angeles, CA, USA). I can find Premium Hi Polymers (like these, but never AIN. So am I right that AIN is outside the US only? Mike - well I'm not in the USA, but Pentel USA website has Hi Polymer and not Ain, so you may well be right. 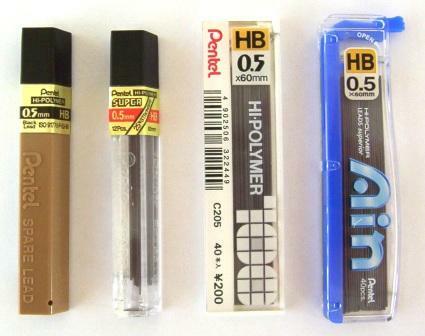 Most USA retail sites seem to have Hi Polymer rather than Ain, but then eBay, importers like JetPens, etc have Ain. 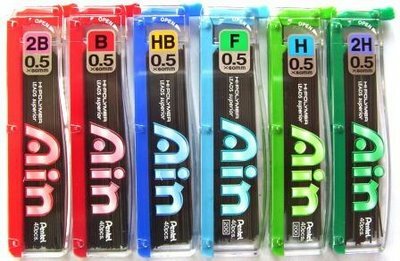 I've been thinking about what different between pentel and Ain for a long times and the answer is here!!!! As I read your blog, I thought of something I did in the past. I've ever test coca-cola vs. pepsi with my friends and mostly we can tell their difference. I understand the concept of volume pricing ie AIN40 v 24 which would reduce the price of the AIN leads slightly but who would buy standard hi-polymer on this pricing. Anyone seen these - Black Ain from Pentel? Seems they put in nano-diamonds ala Mitsubishi NanoDia leads. Where is it posible to buy those Pentel Black AIN leads? Any US internet website? Are the Uni G.R.C.T. available in 0.5mm HB? 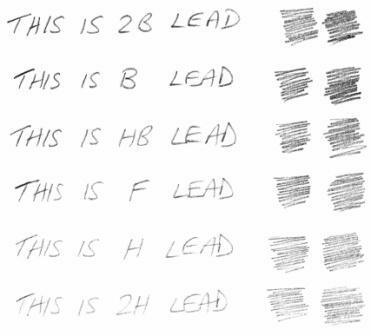 I agree with Tom Golding, above, but I didn't see any questions or info on the other lead hardnesses, such as "F", which is excellent for everyday notes and writing. HB is far too soft and H is too hard except for drawing, perhaps. My best choice is F in 0.3, 0.5, and 0.7mm for all the various types of use. The only place I could find "F" to buy is Pencity.com. 6 other sites I ck'd only had HB and H. Norm Y. In the US we have Pentel Super Hi-Polymer lead only. I have not really seen any other brand of lead sold around me, except in specialty shops, which sell lead from Parker and Staedtler. Books Kinokuniya in Sydney, Australia has some of the Pentel Ain 0.5 3B (not as much as before I got there! ), but none of the 4B alas. 3B is brilliant, and I wish I'd bought the rest of their stock while I was there. Dave, thanks for explaining the different hardness grades. I found a random tube of "F" leads in my desk and had no idea where that fit in the spectrum. Pentel's website did not give me any info (at least that I could readily find). We accountants usually use 0.5 HB's, but I find that I prefer a 0.7 HB for more general use. ScAnMaN - I did ask Pentel but their answer was not particularly clear. It is though my understanding Super Hi-Polymer and Ain are the same lead, just sold under different labels in different markets. AIN 0.3 20pcs, AIN 0.5 40pcs, AIN 0.7 40pcs, AIN 0.9 36pcs. The only super hi polymer tube I have is 0.7 which contains just 12pcs. On a per lead basis I am sure that AIN is cheaper. Sorry, 0.6mm lead is unknown to me. 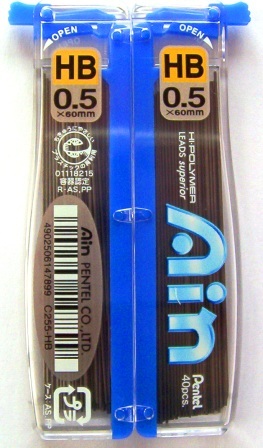 As far as I could tell, the Ain was exactly the same as the Super Hi-Polymer sold in North America. 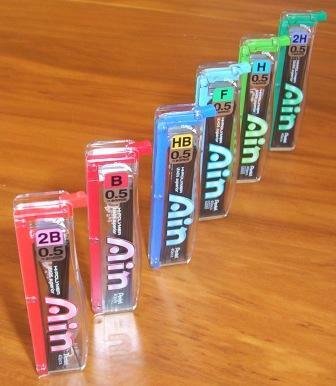 Now, Ain has been discontinued in favor of Ain Stein in Japan. I have just noticed that the Super Hi-Polymer sold in the USA claims a new formula that makes it 25% stronger. I'm assuming it is the same as the Ain Stein. Just doing an experiment, I took one piece of lead from my "labeled" 0.5mm pencil (in Japan). Then my micrometer (0.001mm accuracy). 1)The lead was 0.565mm to 0.574mm, this was the same piece just rotated at several different positions. This is a glorious page! Thank you, Dave. I read it years ago and found it again today while searching for "0.7 mm Pentel Ain lead". Nice to know the Ain is truly superior. I found two tubes of 40 on ebay for $5.77 shipped, but they come from Hong Kong (I'm in the USA). I may order them anyway because it seems like such a screaming deal for a great product. HB is the standard everyday all purpose grade. What is the actual name of the "Premium HiPolymer leads/C205"?